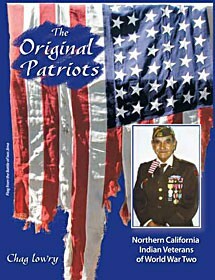 "The Original Patriots: Northern California Indian Veterans of World War Two" by Chag Lowry, Self-published. In Ken Burns’ new documentary series about World War II, which began airing on PBS Sept. 23, only one Native American voice is included. When the series was first announced last spring, there were none at all. After public protest and a quick reedit, Burns added two Latinos and a token Indian to the 15-hour documentary. America’s “first citizens,” it seems, are still the last to be included. The Original Patriots begins with a gloss of Native American history from the Gold Rush up through World War II. From the 1880s to the 1930s Indian children were torn from their families, sent to boarding schools throughout the state and re-educated. They were forced to learn English and punished for speaking their native languages. Most of the vets interviewed attended such schools. From the beginning, it’s clear that The Original Patriots is more than just a compilation of war stories. In the books numerous interviews, Lowry plumbs the vets for information about Native American culture (about languages, ceremonies and native crafts); he asks them to talk about their boarding school experiences; and he tries to understand how they were able to selflessly serve a nation that had failed again and again to serve them. In his introduction, Lowry notes that during the Gold Rush, the federal government paid bounty hunters between 50 cents and five dollars, for the heads, hands or other body parts of Indians in an effort to address “The Indian Problem.” However, a century later, Native Americans were giving those same things up voluntarily in the theaters of war in Europe and the Pacific. Over 44,000 Native American men served in World War II. No other ethnic group made a greater per capita contribution than they did. The book is strongest when Lowry gets the vets to reveal how their Native American identity informed the way they perceived and interacted with the world at large. Still, regardless of how demoralizing their experiences were at times (many veterans recounted stories about not being served in some bars when they returned home after the war because Indians and dogs weren’t allowed), all of the veterans in the book are surprisingly, and deeply, patriotic. The Original Patriots is not only an invaluable collection of candid oral histories which, had they not been recorded, might have been lost forever, it’s also an important supplement to mainstream accounts of World War II that have consistently failed to include Native American voices adequately. Local public television station KEET-TV (channel 13) has produced a local documentary based on The Original Patriots , which goes a long way to filling some of the gaps in Ken Burns’ series. The KEET production features three of the men interviewed by Lowry; it premiered last weekend, but will repeat on Thursday, Oct. 4, at 8 p.m. and Sunday, Oct. 6, at 3 p.m.
To order a copy of The Original Patriots visit www.originalpatriots.com.